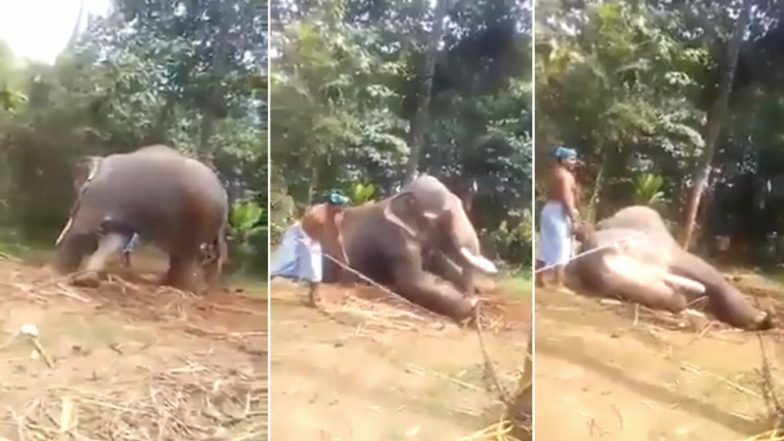 A video going viral on social media shows an elephant being tortured by its caretakers in a clear case of animal torture. The clip which is from Kerala shows its trainers hitting and poking it with sticks. The video shows the men trying to make it move, however, the exhausted animal lays down on the ground. The elephant's legs are chained and it can be seen being forced to move in a circle. IFS officer, Parveen Kaswan confirmed that a case has been filed against the owner and the mahouts have been fired for the torture met out to the elephant. Several videos of elephants being treated terribly have gone viral multiple times in the past. In Kerala, elephants have a lot of importance in the culture and traditions. They are often used as temple elephants, being decorated and paraded during temple festivals. For which they are domesticated by making them go through strict training sessions. They are also used to work at timber yards to carry heavy logs of wood.